Right in the midst of bustling Kolkata lies what might be the most prominent population of Britons in India. Vaihayasi Pande Daniel/Rediff.com walks through the South Park Street Cemetery. Park Street, central Kolkata, has the most prominent population of the British in the city. They reside, or rather repose, in perpetuity, under the leafy, cool bowers of the south stretch of this quaint but bustling thoroughfare. Nearly 1,600 deceased Britons, living elegantly in their own city of the dead. Remains of another day. 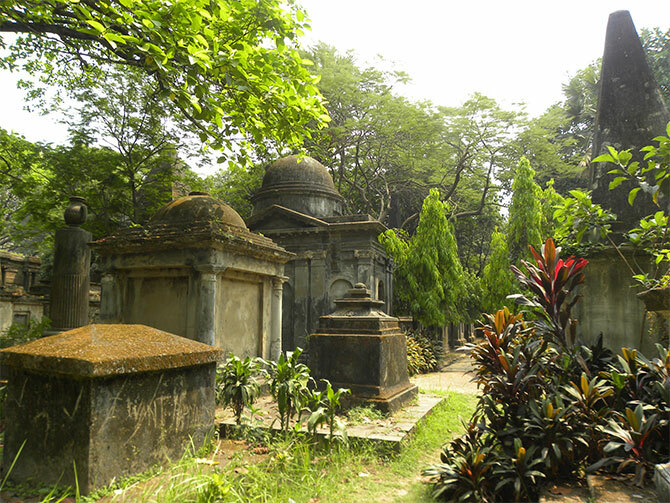 This sanctuary of serenity, existing amidst the muted roar of traffic, is called the South Park Street Cemetery. The avenue, formerly called Burial Ground Road, runs through what was once a deer park, grounds and bungalow of Sir Elijah Impey. Impey was British India's first chief justice and known for wrongfully hanging Maharaja Nandakumar, who famously accused Warren Hastings, the then governor general, of corruption. Eight acres of that park, from 1767, became home to the remains of the late Impey and a society of dead Englishmen and women, as well as a scattering of Eurasians. Bards, botanists, indologists, jailers, translators, postmasters, diplomats, surveyors, judges, housewives, mothers, soldiers, surgeons, teachers, bureaucrats, architects, military officials, tide-waiters (do research that profession) and more have their final resting place in the towering cenotaphs that interestingly look similar to the chhatris -- the funerary architecture of Hindu kings. When one sits on a stone bench in this graveyard -- called once upon a time as the Great Burial Ground -- one can imagine a pageant of ghosts murmuring together in the shade; about botany and a flowering shrub Monsonia, or over the politics of the East India Company, Hastings, Hinduism, Krishna and criticism of Christian missionaries, wicked tropical diseases, Patna Post harkaras (dak runners), the first Anglo-Afghan War, patriotism. Sometimes in iambic pentameter, if they were poets like the gifted Henry Louis Vivian Derozio, who was also laid to rest here. Spirits whispering incessantly under the colossal banyans and stately peepuls, which rustle in the breeze. 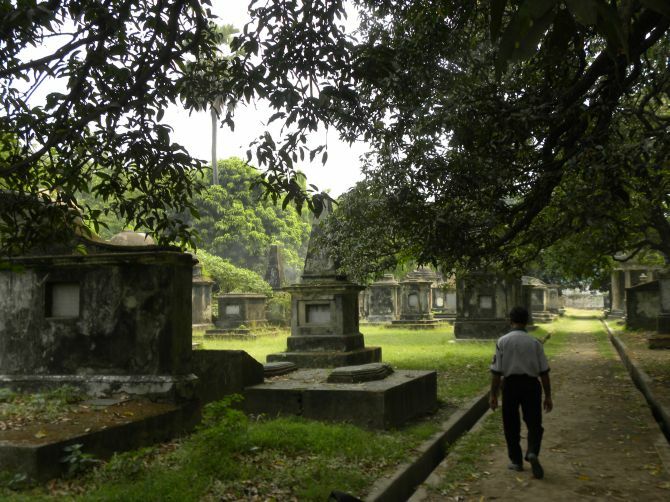 Not surprising then that it is considered one of the most haunted spots of Kolkata. You would be forgiven for half agreeing. The architecture chatters together too, sometimes none too peacefully. Gothic argues with Dorian and Ionian with Corinthian. Indo-Saracenic quibbles bitterly with Pancharatha-Rekha Deul, a particular Odisha style that adds a quirky accent to a Christian cemetery. One has the eight acres just to one's self. Almost. There are no charts or key maps to the tombs -- some of which are fading and rapidly crumbling or graffiti-sed with games of tic-tac-toe -- so stumbling through the undergrowth, one bumps into all kinds of interesting oddities of history, not just architecture. The sheer footage of the tomb masonry -- 50 bags of cement per head likely -- that must have cost pretty pence in those days, is bewildering. The Archaeological Survey of India attributes this to both pomp and to preventing the wildfire spread of the deadly diseases that some of these 1,600 died of. Reading the epitaphs at this cemetery is like perusing an anthology by the English Romantic wordsmiths of that era. The tomb memorials seem to echo bits of Thomas Gray's Elegy Written in a Country Churchyard; or then a stanza or two of Worsdworth. Paras of Walter Scott. But the epitaphs, please note, were all written in an India that was celebrating Mirza Ghalib at the time. Sacred to the Memory of Robert Gardiner Who was Unfortunately Wrecked in the Ship Ganges on the Barabullor Sand in the River Ganges... this monument is erected from a Motive of Filial Regard by his Affectionate Son Andrew Gardiner. Or: Major George Downie, Died 4th December 1808. Aged 47 years. A Character every way creditable, to Human Nature, If Honest, if purity of Principle, Filial, and Fraternal Affection, a conscious discharge of his public and private duties, if Charity, and the practice of every virtue that enobles the character of man, Merit the Kingdom of Heaven, the living only have to lament his premature death. Grave 363 is anonymous, the number stamped in a sarkari red and its message cryptic but poignant: A virtuous mother. Died 1825. South Park Street's most illustrious dead are: Sir William Jones, who founded the Asia Society; Walter Landor Dickens, an East India Company official and son of Charles Dickens; Richmond Thackeray, father of William Makepiece Thackeray who wrote Vanity Fair; and Rose Aylmer, the muse of British writer Walter Savage Landor's poem of the same name. And then there's the colourful, eccentric Charles Hindoo Stuart, who rests eternally in a Hindu-temple-shaped tomb! This Irish military officer, and later major general, came to India as a teenager and never went back. He Hindu-ised himself, quickly adopting Indian traditions, languages, clothes, befriending Lord Krishna and bathing in the Ganga daily. An interesting footnote to the history of the South Park Street Cemetery and the British Raj are the refurbished or newly-renovated graves. 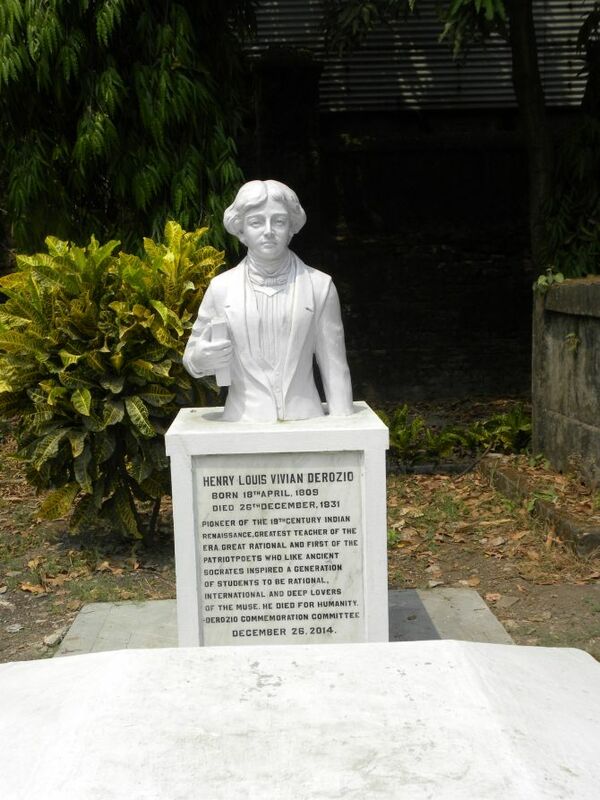 There are about a dozen graves that have been restored and whitewashed by descendants of those buried here. 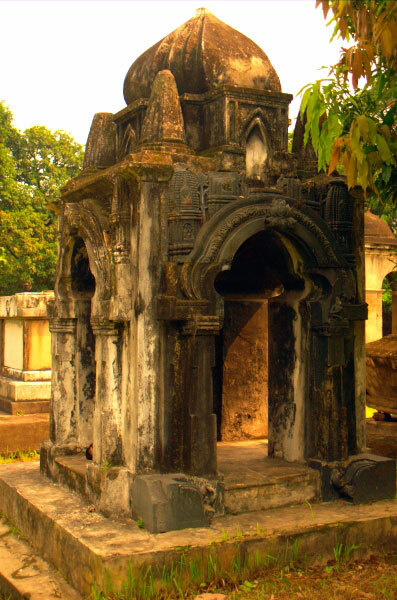 For instance, the grave of Lady Anne Monson, who died in Kolkata in February 1776, is all spruced up. This English noblewoman, who collected specimens of plants and insects, was the great-granddaughter of England's King Charles II and was termed by historical records at the British Museum as 'a remarkable lady botanist' and someone who helped translate Swedish scientist Carl Linnaeus's noted Philosophia Botanica into English. Last year, Nicholas John Monson, 12th Baron Monson, came back to India with his mother Emma Windsor-Clive and daughter Isabella Monson and a few other British peers, to commemorate his celebrated ancestor with a small ceremony of rededication, after the grave was refurbished. Remembers Isabella Monson in an e-mail to Rediff.com: "My grandmother had always taken a keen interest in family history and in 1985 started researching the family members who had lived in India, including Colonel George and Lady Anne Monson. My father visited South Park Street Cemetery in 2010 and tracked down their graves with some difficulty." Recalls Nicholas Monson, of his initial adventure, "It was me who rediscovered their graves. The cemetery keeper Mr Brown challenged me on their existence. Forty minutes later, I reported back to his office with their location. He entered their graves then in his records. A proud moment." "Lady Anne's original gravestone's inscription from 1776 had eroded," adds Isabella. "So, in 2013, my grandmother, together with those at the South Park Street Cemetery, organised for it to be re-inscribed. It was completed in 2015 and the cemetery had the idea to have a blessing." "It was an important occasion for us and for all those involved. We were delighted at the sight of the newly-inscribed gravestone, which honoured a truly remarkable woman's memory. The occasion was very moving. The other people there were my boyfriend and his mother, and friends of my grandmother who happened to be in Calcutta. Everything ran very smoothly, except for our connecting flight which meant us getting stuck in Delhi for seven hours!" she says. The few visitors/tourists that do show up at South Park make a beeline for the graveside of Derozio, that basks in the bright sunshine, on the periphery of the burial ground, not comforted by the embrace of tree branches. 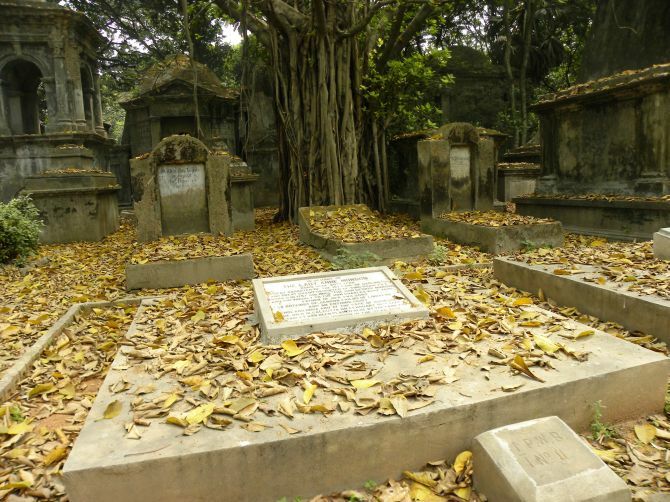 Research online indicates that the great Anglo-Indian poet -- most famous for his Indian nationalist verses from To My Native Land -- was denied burial in the proper graveyard because he was considered a Christian apostate. An uncompromising reformist, he had much to do with the Bengali Renaissance. But holy stars alone their nightly vigil keep.